NEW SECONDARY MARKET PRINT: $395: World War II's Battle of Midway was the turning point of the war in the Pacific, leading to eventual Allied victory. At the very start of that fateful conflict came this ominous confrontation. 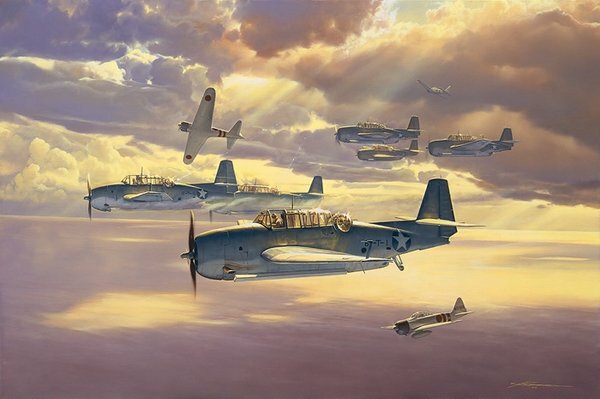 At 7:00 a.m. on June 4, 1942, Grumman TBF Avengers of the VT-8 squadron on their maiden combat flight were attacked by Japanese Mitsubishi A6M Zero fighters. 8-T-1 was the only Avenger to return from the encounter and pilot Bert Earnest and tunnel gunner Harry Ferrier were the only two men on that aircraft to survive.